Samuel Beckett was very precise with the stage directions for his plays. So, when beginning to read Krapp's Last Tape, a very short play, it is not surprising that the initial directions (before Krapp says a single word) take up one whole page. We learn a lot about Krapp in that page, before the dialogue begins, and he actually turns on the tape. There is even a bit of slapstick comedy (not many moments like that in this brief drama) involving a banana peel and, as he chooses a spool (this is what we would now consider an antique tape recorder with large 'spools' of tape), he draws out the word "spooool" in an almost loving or endearing way that suggests the importance of the memories ensconced on the tapes. He begins to listen to himself starting the dialogue, such as it is, between a sixty-nine year old man and his younger, thirty-nine year old self. He says, "hard to believe I was ever as bad as that" (p 10). It the voice of a cynical disillusioned old man listening to the more hopeful younger man. Their voices and psychologies are different. One way to imagine his feelings upon listening to the thirty-year old tape is to compare it to reading an old personal journal you may have kept or try to decipher the annotations you made in a favorite old book. There are crescendos and decrescendos in the voice of the older Krapp. At times he caresses the tape player and leans toward it to listen more clearly (or not). It is a play of light and dark. The dark representing the present is seen in Krapp's myopia and the lighting and his own words. "clear to me at last that the dark I have always struggled to keep under is in reality my most unshatterable association until my dissolution of storm and night with the light of the understanding and the fire". (p 9) He turns on the tape again and is jolted by the voice of his younger self in a tender emotional moment. 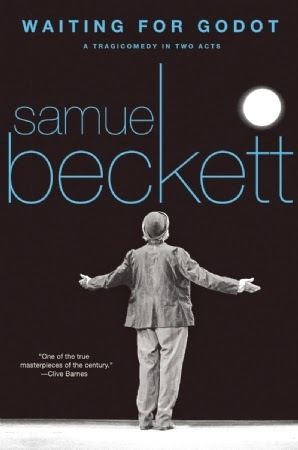 One may compare this drama by Beckett with the writing of Marcel Proust as they are both concerned with the contrast of finite human memory against nearly infinite time. They lay bare a tragic fact of a human existence: we compare the limitations of our own memories to the ceaseless expanse of time and space surrounding them. Beckett's and Proust’s works demonstrate the deliberation over the extent to which we can understand the past, and they represent that past via language and the degree to which can we know either ourselves or others. In this play we have the older Krapp pouring over the pronouncements of his younger self while in the last volume of Proust's masterpiece (especially) the narrator is jolted by the changes in his friends that distance both them and him from their remembered selves. Both authors might suggest that what we can know of any of these things is an extremely limited amount, if it is any amount at all. 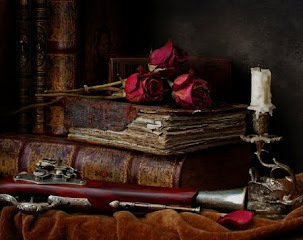 "Poetry is when an emotion has found its thought and the thought has found words. " Listening to Schubert, while driving from Chicago to Lake Geneva in Wisconsin, last Friday afternoon put me in a good mood for a weekend trip. One other moment on my journey seemed to be a sign. That was a detour just before I turned off the north-bound highway to take the west-bound highway that would bring me to my destination. For it was this detour that signalled the weekend, like many I had experienced before, would be one that would take me away from the regular routine of my life and into a wondrous other world for a couple of magical days. As I drove I listened to some solo piano music and the Schubert I listened to was the wonderful Impromptus for solo piano, Op. 90. 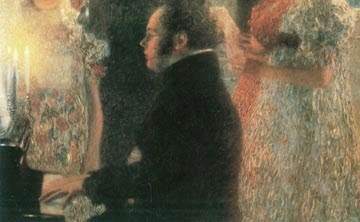 These are short pieces (for the piano in this case) that are reminiscent of an improvisation. Impromptu also carries the implication of the unexpected and that seemed a felicitous blending of some of my favorite music (I even have one of Schubert's Impromptus, Op. 142, in my personal repertoire) with the weekend of Poetry that would take me away from my ordinary routine. The weekend was filled with both the expected and the unexpected. A dualistic trip in which the two melded into one joyous experience. The surprising and gentle grace of the Wisconsin air became a foundation for our weekend retreat. There were talks and discussions with speakers that I had planned to hear and discussion leaders that while unforeseen by me were welcomed as old friends. The poetry of Robert Frost filled the air of the Lake Geneva Inn where we encountered both nature and nurture within an atmosphere that included moments of serenity and suspense. In other words it was a welcome retreat in the springtime to nurture our minds and open ourselves to the music of the spheres. I commented earlier this month on Robert Frost's poem "Mowing" that was included in his first published collection, A Boy's Will. Another poem in the same collection, "Pan With Us," acknowledges a changed, modern world with a little more nostalgia for the old mythological creatures of poetry. 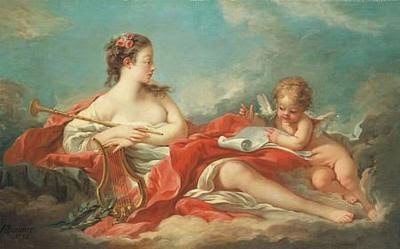 Pan was the son of Hermes and Penelope (later married to Odysseus) in some myths and the son of Zeus and the nymph Callisto in others. He is the god of flocks and shepherds. He is mostly human in appearance but, with goat horns and goat feet. He is an excellent musician and plays the pipes. He is merry and playful frequently seen dancing with woodland nymphs. He is at home in any wild place but, is favorite is Arcadia, where he was born. He is always in pursuit of one of the nymphs but, always rejected because he is ugly. In Frost's poem Pan is represented by grayness in the second line—almost a cinematic dissolve of the old pipe-playing, sexual, half-animal creature—justifies and animates the grammatical inversion of the following line: "The gray of the moss of walls were they,". Note the other contrast as Pan comes "out of the woods" and stands "in the sun". While looking over the valley and hill one may wonder that his eyes may be somewhat blinded by the sun. A reference that conflates the early Greek myth of Pan with Plato's later myth of the Cave. This betrays Frost's own philosophical background as he was taught by Santayana at Harvard and read the classics. Nonetheless there is also a sense that the poem is partly a lament for old ways and partly a parody of them. 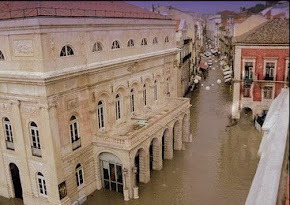 In spite of his sense of peace, since "He saw no smoke and he saw no roof. ", there was something new, "The times were changed from what they were." Thus he found it too hard to teach his old pipes a new song. The world "has found new terms of worth" and he laid down with his pipes in bemusement. - John Donne, from "The Ecstasy"
Robert Frost's short poem "West-Running Brook" is a little drama about some very big ideas. He began writing the poem in 1920 and decided to make it the the titular piece for a collection of poems he began compiling in the winter of 1927 and saw published the following year. One notices that, of the couple in the poem, we have only a name for the man. His wife is either "my love" or "my dear". Our arm thrown over it asleep beside it." "It wasn't, yet it was. If not to you / It was to me--in an annunciation." "A universal cataract of death / That spends to nothingness". It is a throwing back (another sort of contrary) that demonstrates to us our source, the "nature we are from." His lengthy commentary on the source of life and the nature of its flow with currents "against the stream" seems an excess of eloquence. All this may be most unsettling to his wife, but her comment is a more simple recognition of where they are that concludes with "Today will be the day of what we both said." I like the recognition that while she seems to say in effect we will agree to disagree, she is still referring to "we". They are a couple whose love, like that of Donne's (see the epigraph above) and many others can withstand such disagreements. 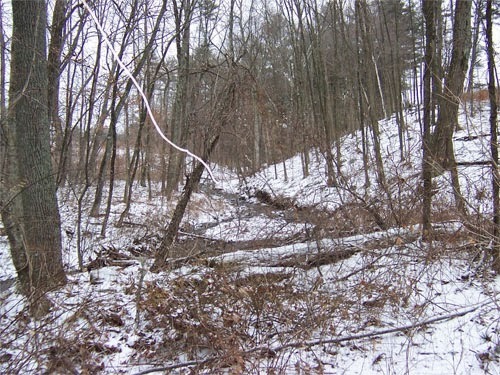 But we should note that this poem demonstrates many of Frost's preoccupations with its eloquent use of the stream metaphor and his ability to merge the dramatic with the lyrical form. The poem, at least if you side with Fred, seems to suggest that as humans we are ultimately redeemed by our natural resistance in the face of extinction. But, as is usually the case with Frost, the meaning is not explicit, the difference between husband and wife is not resolved. It is left on the table. Yet, the poem ends with them still a "we". 'North? North is there, my love. Because we're -- we're -- I don't know what we are. We've said we two. Let's change that to we three. Our arm thrown over it asleep beside it. In that white wave runs counter to itself. Long, long before we were from any creature. The stream of everything that runs away. To fill the abyss' void with emptiness. To separate us for a panic moment. It flows between us, over us, and with us. As if regret were in it and were sacred. 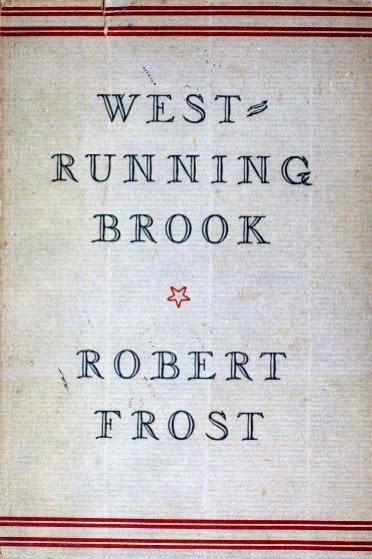 West-Running Brook by Robert Frost. Holt & Co., 1928. Tyler Cowen is a writer, blogger, and an economist. It is in the latter role that he is foremost although his influential blog, Marginal Revolution, is renowned and I would certainly recommend it. He has written five books, not counting textbooks, and his latest is Average is Over: Powering America Beyond the Age of the Great Stagnation. While the title tells you about the main theme of the book I found that, beyond the economics of our current snail-like recovery from the depths of the recession, this book is a cornucopia of ideas about a diverse number of aspects of our life both now and in the future. There are three Parts to the book which focus on first, the growing divide between those who earn more, much more than average and those who are below-average earners; second, the importance of machines and, in particular, games in our future; and third, the changing nature of work. The opening chapters establish some of the important themes for the book by describing the current environment of stagnation and making the claim, that will be supported by examples throughout the book, that "new technologies already emerging will lead us out of" the current stagnant economy. In fact the economy is not stagnant for everyone, for those who have already adapted and are involved in the "right" sectors of science, technology, engineering, and math (STEM), in particular the growth in computers, the Internet, and most importantly intelligent machines. Cowen also introduces the metaphor of Chess that returns again and again throughout the book. You do not need to be an expert in the game to understand the power of intelligent machines that can 'crunch' the data necessary to defeat grandmasters every, every time they are challenged. He supports this with examples from areas like the growth of cell phones in both quantity and quality, the changes brought about by super-computers that play chess and for several years have been significantly better than the best grandmasters, and the changing nature of work with examples from companies at the forefront of the new age like Google and Amazon. The tests given prospective employees at Google are described and they seem like something out of a trial for Mensa. Are they easy? The days when you could just show up, role up your sleeves and start selling or doing any job are dwindling. The changes discussed, documented, and commented upon in the first part of the book carry over into the latter two parts. There are and will be more changes to the nature of how you obtain a job --note the impact of social networking websites like Facebook or LinkedIn-- and your workplace whether it is an office, a factory or a sales counter. That the days of the lone scientist are over seems even more true as the complexity of machines as tools grows exponentially. Education faces changes as well due to the impact of the world of new machines. Cowen discusses the rise of MOOCS (massive online courses), information blogs, and the ubiquity of avenues for online education. But there is more. The economics profession is like other social sciences and, like the economy as a whole, will be changing in ways that both take advantage and depend upon ever more powerful and complex computing and communication devices. There is much more in this challenging compendium of facts and ideas that will change our world. The direction of this change will determine where you and I will be and what we will do in the age of intelligent machines. In Average is Over you get one very knowledgeable economist's glimpse into that future. My introduction to the writing of Muriel Spark came through reading The Prime of Miss Jean Brodie (after having enjoyed the film version). While I enjoyed this read I had not read any other novels by her recently so I was not sure what to expect upon picking up The Mandelbaum Gate. I am told that it is in some ways not typical, though her books do cover a variety of geographical locations and types of character. It is longer than most, if not all, of her other books as she tends to write quite short novels, and the economy of her prose must in part account for that. The book is set in 1961 in Jerusalem but it is a 'historical novel' only in the sense that like that genre it is firmly set in a particular time and place. It was published in 1965, so Spark was writing only shortly after the events take place, and was therefore discussing relatively current events. The Mandelbaum Gate divides Israel, or Occupied Palestine, depending on your political viewpoint, from Jordan. The political divide takes no account of the sites holy to Christians, and so pilgrims - such as Barbara Vaughan, one of the main characters in the book - are hampered by having to pass through the gate (and needing proof of baptism to do so) if they are to see some of the locations associated with the life and miracles of Christ. Barbara's situation is complicated by the fact that she is half Roman Catholic and half Jewish - the latter being reason enough not to mean that she would be in danger of being arrested as an Israeli spy should she be found on the Jordanian side of the Gate. Alongside these two main characters are a number of dependent players on both sides of the Gate, including the Cartwrights, Freddy's British friends on the Jordan side with whom he regularly stays; the Ramdez family - ostensibly running a travel agency, but using this as a cover for various other activities - Abdul, the son, teaching Freddy Arabic on the Israeli side, Joe, the father, a rather uninviting character running a brothel on the Jordanian side, where Suzi, his daughter, eventually takes Barbara when they smuggle her through to Jordan. Freddy seems at first attracted to Abdul, but transfers his affection to Suzi, who resembles her brother closely - they are described as beautiful, dark skinned but blue-eyed. It is Suzi's resemblance to Abdul that seems at first to attract Freddy to her. 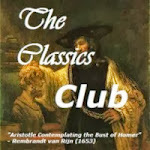 There is also Alexandros, lover of Suzi and owner of a gift shop; Saul Ephraim, archaeologist and unofficial tour guide for Barbara; Rupert Gardnor, colleague of Freddy, and his wife Ruth; and hardly appearing and yet important to the whole thing, Ricky (Miss Rickward), headmistress of the school in which Barbara teaches in England, and Harry Clegg, Barbara's fiance, and archaeologist working in the Dead Sea area. The story is primarily about Barbara's attempt to gain access to the biblical sites on the other side - the Arab side - of the Mandelbaum Gate, but of course it is really about religion, politics, faith and the complexity of life. No character is entirely clear to us, no one's motivations are entirely certain, no one is entirely virtuous or unvirtuous, with the possible exception of Joe Ramdez. The story is firmly set in a specific place and time with the Eichmann trial occurring in the background indirectly connected through a relation of Barbara. There is also Nasser's Post Office, Jewish cousins in Golders Green, and Freddy's amnesia among the many events that transpire in this detailed but not too busy book. What is typical of Spark in this book is her style of writing, which is precise yet comfortable. It invites the reader to relax and enjoy details that, while not inconsiderable all of which seem to move the story forward, fill in details that help make sense of the plot without impeding any suspense that has built up. There is also a sense of humor and wit amid the very serious issues, a wonderful use of repetition and of moving the narrative backwards and forwards in time, a sort of helix effect of strands spiraling around each other, with the author in complete control - this is often enough to make me laugh at its cleverness, as well as the witty elements in the writing. She always seems to invest much vigor in her writing which is taut but with a sort of panache. Through a solid foundation--the structure allows the novel to grow slowly but not too slow--the story gradually comes to a satisfying denouement. There are motifs such as Freddy's attitude (such as it is, it takes some of the edge off any sense of danger), and biblical references like this phrase from the Book of Revelation - "Being what thou art, lukewarm, neither cold nor hot, thou wilt make me vomit thee out of my mouth." Both Freddy and Barbara independently decide that people should really not quote the Scriptures at one, and yet that phrase keeps coming back. It seems what the novel is all about - the clash of British culture, where one's religion is no one else's business and yet of vital importance in various ways, with Middle Eastern culture, where it is a matter of life and death, and one cannot afford to be lukewarm. One moment that this becomes more clear is when Freddy and Suzi are taking Barbara, wrapped in the clothes of an Arab servant and lying low in the car, through part of Jordan, and Freddy thinks they will all feel better if they stop for a pink gin before lunch. That is typical of Freddy, but also indicative of the overall theme of the novel. The novel ends, wonderfully, with Freddy exploring Old Jerusalem and describing, for the first time in the novel, the actual Mandelbaum Gate--a fitting conclusion for this fine story. As the second act of Waiting for Godot begins Vladimir and Estragon are in the same place they were at the beginning of the play. That is it seems to be the same, a country road, a rock to sit upon, a tree. But the tree has leaves that it did not have in the first act. The pair enter into a discussion about several things but soon turn to examine the tree, and its leaves. They cannot agree whether the leaves were there the day before or not. Is it the same tree? Are they in the same place? Where were they the day before? The play seems once again frozen in a world of bewilderment. But perhaps this is a variation of what was called the "imponderable" by Ludwig Wittgenstein. That is the discussion verges on what might be called imponderable evidence. That is the notion discussed by Wittgenstein near the the end of the second part of his Philosophical Investigations when he talks about "imponderable evidence" as that which is not "documentary" and represents those things for which language has no words. How can we tell if that tree was genuinely the same tree as yesterday or even that our memory of what happened yesterday is genuine? The play ends the same way the first act ended with the visit of an unnamed boy with the message from Mr. Godot that he will not be coming today, but he will be coming tomorrow. Vladimir and Estragon agree to wait for another day. Estragon has the last words, "Yes, let's go. [They do not move.]" Waiting for Godot by Samuel Beckett. Grove Press, 1954 (1952). My introduction to the poetry of Robert Frost came in a class in American Literature which was the focus of my Junior year of high school English. It is there that I began to truly enjoy poetry while reading the major American poets like Bryant, Emerson, Robinson, Masters, Lindsay and others. My favorite was Emily Dickinson, but it was in that class that I also began to appreciate another truly American poet, Robert Frost. Imagine my surprise upon reading his biography and learning that his first collection of poetry, A Boy's Will, was first published in England. Ezra Pound (who I had not discovered yet) read a pre-release copy of the book and proclaimed (to Harriet Monroe); "Have just discovered another Amur'k'n. VURRY Amur'k'n with, I think, the seeds of grace." 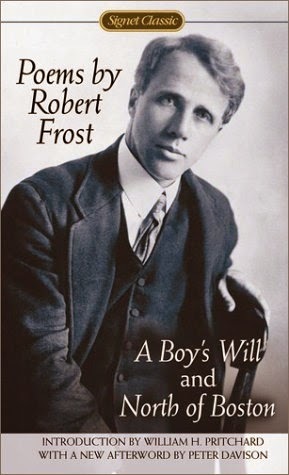 The seeds of grace--while I did not have that opinion I began to realize, at least in a superficial way, the importance of the best of the poetry of Robert Frost in that class almost fifty years ago. Currently I have begun to reread both in depth and more broadly through his poetry in an attempt to add more understanding to my enjoyment of his verse. I hope to share some of my thoughts in the near future. In the meantime here is one of the poems that impressed Ezra Pound and others back in 1913. The poem's persistent exhibition of onomatopoeia is almost mesmerizing. The internal rhymes and constant alliteration seems to bring out the very sounds of mowing. "Wake from out my midnight ramble. Life is just a massive gambol." This wonderful book is both an anthology of poetry and an introduction to poetic forms. Apparently it is one of a series of similar literary compilations, all edited by Mr. Parrot. He spent many years as a teacher of English and General Studies, and reminds me of the character Hector in Alan Bennett's play, The History Boys, because of his eclectic taste as demonstrated in this book (and presumably his other collections). Useful as a reference through the inclusion of all known poetic forms and not a few unknown (to me), it is a review for those, like myself, that are rusty on the details of the form of poetry if not the substance. While rhyming and meter and stanzas are encountered there are sections of poetic fancies, light verse, terse verse and more. The forms are demonstrated in all manner of ways, one being the parody like that in the epigraph above that mocks the famous "Fern Hill" of Dylan Thomas. This should provide brief evidence that poetry can be fun for all who love words or at least wonder about them. The delight is in learning about the form and being of poetry while experiencing rhymes from a gathering of contemporary poets who provide exceptionally entertaining evidence of the magic of verse. Often with tongue-in-cheek he gathers poems and poetic bits of verse with both demonstration and entertainment in mind. The result is a book of poetry presented in its most entertaining form. For that and for the inspirational value to encourage me to expand my poetry horizons I am grateful. Mon Dieu! What recollections that unloosed." You'd say that Helen must have got on very well with sailors." Every Man a Murderer, published in 1938 even while the author was working on his larger work-The Demons, is a story of personal and political crisis. The political crisis is exemplified by the rise of National Socialism while the personal crisis has its roots in Doderer's relationships, especially his marriage and divorce. Only when Conrad begins to respect this is he able to become a person by overcoming his fate. The oppressive atmosphere of the Gestapo-like society provides a surreal and sinister background for Conrad's story. The novel is one of ideas, spiritual linkages, and metaphysical drama, reminiscent of Hesse and Conrad or perhaps of Thomas Mann which for some readers is enough to recommend it. "The man who lay beside the pile of lumber was no longer sick. He was, in a manner of speaking, far healthier than anyone else, for he was dead.” Or: “If anyone says, ‘Nonsense!’ in regard to something, it generally shows that he has not dealt inwardly with the matter." This is a novel for those interested in ideas and man's spiritual dilemma. According to the OED the word horror was used in the sense of a "loathing fear, feeling terror or repugnance", as early as the fourteenth century with one example cited from no less than Chaucer in "The Parson's Tale" from his inestimable Canterbury Tales. So the notion has been around a long time and in use by a broad range of authors. This anthology provides just such a broad range of writers both famous and those not so well-known. Writers include expected representatives like Poe, Henry James, Balzac, Maupassant, Stevenson, and Bierce, among others. But there are those unexpected and unknown to this reader like Percival Landon D. K. Broster, and Monica Dickens. Those authors are surprisingly few and those who are famous also include twentieth century contributors like Bradbury, William Faulkner, Patricia Highsmith and Roald Dahl. This is a quality collection of some of the best examples of the horror story genre that I would recommend to both beginners and experienced readers of terror-filled and haunting tales. This is a very small book about some big issues; namely the "relation between mind, brain, and behavior in living animal organisms" and its relation to the cosmos. Thomas Nagel has written a provocative book aimed at both serious readers and other philosophers. Whether he succeeds in his goal of explaining the implausibility of materialist theories is in doubt, but there is no doubt that he provides some challenging ideas about the way we can philosophize about the nature of mind. The book starts sort of in midstream discussing modern materialist theories; with a focus on the "failure of psychophysical reductionism." This is the position in the philosophy of mind that proposes that the physical sciences will be ultimately capable of providing a theory of everything. It is known as as reductionism. In addition to attacking this he proposes that the development of mind raises questions that the evolutionary theory of the development of life forms can explain the complexity that is evident today. He also criticizes the idea that consciousness is merely a side-effect. In this he is successful at least from this reader's perspective. It seems evident that life is more than just an accident that keeps happening. After a discussion of anti-reductionism and the natural order the book follows with chapters on consciousness, cognition, and values. In his discussion of cognition he proposes a teleological, or goal-oriented, development of "biological possibilities". This is presented as an alternative to the alternatives: chance, creationism, or directionless physical law. He does not recognize that evolutionary theory suggests that certain developments might be inevitable, or at least predictable. His proposals are made as reasonable alternatives to theories that he suggests have reached a dead end. In presenting them he does not argue from proof, but rather suggests his alternatives provide what may be considered a new paradigm that will allow progress in areas like the relationship of consciousness and the brain and evolutionary development. He concludes that the best alternative is a naturalistic, though non-materialist, alternative. Thus Mind is not an inexplicable accident or a divine and anomalous gift but a basic aspect of nature that we will not understand until we transcend the built-in limits of contemporary scientific orthodoxy. Some questions that were raised in our discussion of this book included whether there is life or consciousness elsewhere in the universe, if the ability to create life in the laboratory would have any bearing, and if we could create consciousness in computers would this make a difference? Unfortunately the author does not explore these and many other issues in this short book. While Nagel is an atheist, he adds that even some theists might find his proposed views acceptable; since they could maintain that God is ultimately responsible for such an expanded natural order, as they believe he is for the laws of physics. My fond memories of growing up in Wisconsin create a warm place in my heart for this memoir about growing up in a Wisconsin of the previous century; then as the mid-western frontier. Hamlin Garland captures the essence of the place and time that was already a distant memory during my boyhood. He does this through advocacy of a form of realism that blended the realist's insistence upon verisimilitude of detail with the impressionist's tendency to paint objects as they appear to his individual eye. He begins in a tremendously moving fashion with the first time he met his father who was returning home from the Civil War in 1864, as he was a baby when his father went off to war. ""Come here , my little man," my father said.--"My little man!" Across the space of a half-a-century I can still hear the sad reproach in his voice. "Won't you come and see your poor old father when he comes home from the war?" Garland narrates his memoir in chronological fashion tracing the events of his boyhood, first in Wisconsin and later in Iowa, and continuing into adulthood with his own travels and development as a writer. He uses a first person narrator but, he has two different "I"s telling the story. Using a "double angle of vision" Garland frequently shifts from telling his story from a youthful perspective to viewing the events and commenting on their significance as an adult. It is a very personal narrative where he does not claim to be telling the literal truth but only his personal or interior truth. The story is shaped by his own reminiscences and recollections of the past forming a sort of literary impressionism that Garland called "veritism". The veritist differed from the realist, Garland claimed, in his insistence upon the centrality of the artist's individual vision: the artist should paint life as he sees it. In doing this he brings his world alive for the reader. The stories of his family life, with his brother on the farm and in school, his uncle David playing the fiddle, and the life of the prairie with its flora and fauna were the sections that I enjoyed the most. In later life he would go on to write short stories that were gathered in the collection Main-Travelled Roads and, four years after Son of the Middle Border he wrote Daughter of the Middle Border for which he was awarded the Pulitzer Prize for Biography. I think the depiction of a warm family life on the prairie, a region's characters, customs, and textures of life creates an interesting read even for those who do not share a personal connection with the beauty of Midwestern life. Cogito ergo sum, "I think, therefore I am", is a philosophical proposition by the French philosopher René Descartes. The simple meaning of the Latin phrase is that thinking about one’s existence proves—in and of itself—that an "I" exists to do the thinking; or, as Descartes explains, "[W]e cannot doubt of our existence while we doubt … ." While other knowledge could be a figment of imagination, deception or mistake, the very act of doubting one's own existence arguably serves as proof of the reality of one's own existence, or at least of one's thought. It is the one thing of which one could be certain. In Samuel Beckett's play, Waiting for Godot, there is one thing that is certain as well. It is that the characters, Estragon and Vladimir, are waiting for Godot. Estragon opens the play with the statement, "Nothing to be done." This is a sign that there will be little action in the traditional sense in the play. It is also a metaphysical statement about life, Estragon's life and life in general. As the play opens the dialogue between Estragon and Vladimir sometimes seems like parallel monologues. As often as they answer one another they also veer off on seemingly absurd tangents only to circle around to what seems like similar topics as the dialogue continues. I use the word continue because there seems to be a lack of progress. The setting is "A country road. A tree. "; the time, "Evening." And it could be any country road with a lifeless, leafless tree at any time in the past, although from the dialogue one may infer that they are a significant number of years beyond the "90s", which may refer to the previous century. And they refer to the Eiffel Tower; thus they may be in France near the end of the nineteen-forties which is when Beckett began writing his "tragicomedy". Beckett’s first serious dramatic work has become a landmark in modern theater. It was published in French as "En attendant Godot". 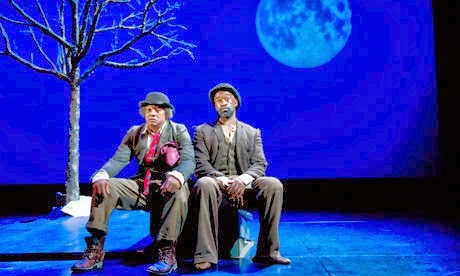 According to the publisher, “the story line evolves around two seemingly homeless men waiting for someone – or something – named Godot. Vladimir and Estragon wait near a tree on a barren stretch of road, inhabiting a drama spun from their own consciousness. The result is a comical wordplay of poetry, dreamscapes, and nonsense, which has been interpreted as a somber summation of mankind’s inexhaustible search for meaning. 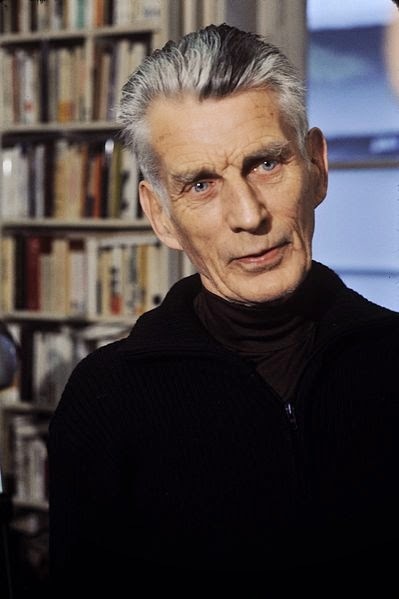 Beckett’s language pioneered an expressionistic minimalism that captured the existentialism of post-World War II Europe. " The play is presented in two acts in both of which nothing happens. Some moments from the opening pages of the first act serve to define the characters and their (imaginary? or not.) world. Estragon seems beaten down as he spent the night in a "ditch" and when asked by Vladimir, "And they didn't beat you?" Estragon replies, "Beat me? Certainly they beat me." Thus confirming that he is not only figuratively, but literally beaten down. Vladimir has a more upbeat tone to his commentary, more voluble yet still spare with words, and sometimes, however briefly, betrays doubts only to quickly move on to a more positive tone of thought. Thought is something that is clearly evident in the manner and words of Vladimir while Estragon is so terse in his remarks, often in the form of questions, that he seems to lack the ability to think. That is, until you pause to meditate on his remarks and they begin to assume metaphysical importance, or perhaps not. Slowly topics emerge from the dialogue: the thieves who were crucified with Christ, the barren tree beside the road, suicide, and others. Yet, the dialogue seems to drift off in directions that one would never expect when discussing these, or any ideas. The unexpected becomes what you expect and the absurd becomes the norm in this play whose characters search for meaning in the nothingness of their presumed existence.